The fertile North Loup Valley provided food and construction materials for the early settlers of this region. When they came here in 1872 they were greeted by Jack Swearengen, a trapper, guide, and government scout. He lived near here in a dugout in the white chalk bluffs that rise above the valley. The highest hill became known as "Happy Jack's Peak" and served as a lookout-point to guard against surprise Indian attacks. The hills took on added importance in 1877 when Ed Wright began to mine the chalk. With stone cut from the bluffs, Wright completed construction of a general store in 1887. This building still stands in Scotia, two miles north of here. Other pioneer residents soon began using chalk in the foundations of their buildings. The mine stood idle for a number of years. It was reopened in the 1930's by a paint company of Omaha. The chalk was used in a variety of ways, not only in paint and whitewash, but also in cement, polishes and chicken feed. These formations of calcarious rock, which can be seen throughout the North Loup Valley, were permanently preserved here in 1967 when the mine area was purchased by the Nebraska State Game and Parks Commission for use as a way-side park. 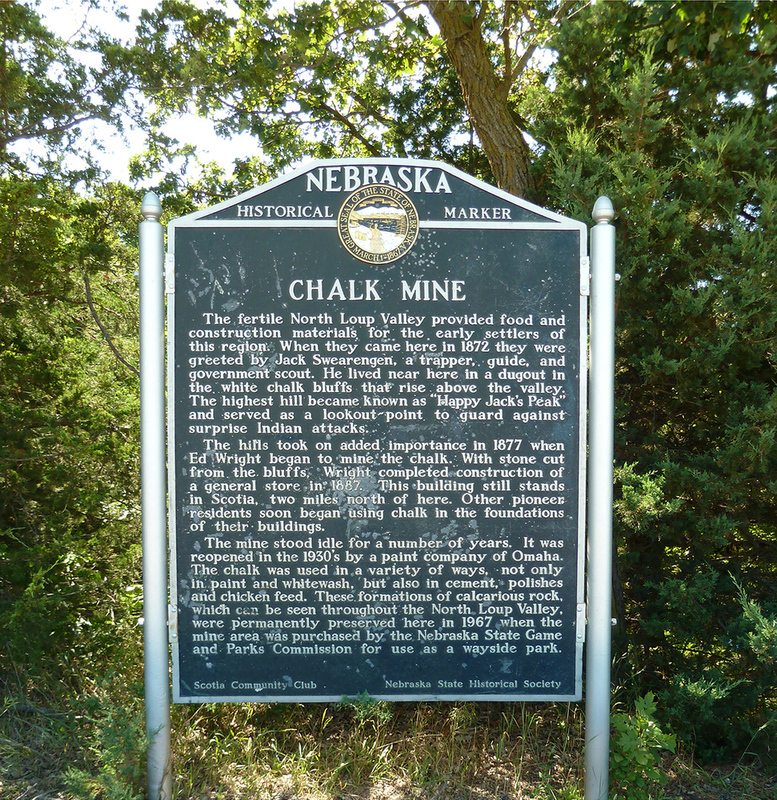 “Chalk Mine,” Explore Nebraska History, accessed April 18, 2019, https://mynehistory.com/items/show/244.